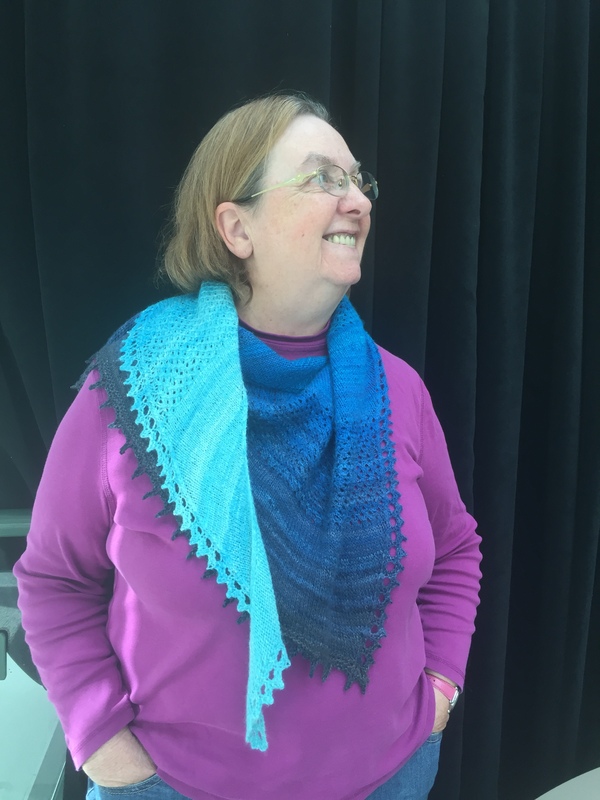 The Peace Arch Weavers and Spinners Guild is hosting Fibre Flare 2917 at Turnbull Gallery, South Surrey Recreation & Arts Centre, 14601 20th Avenue, Surrey BC on Friday, November 3, 12-5 pm, Saturday, November 4, 10-5 pm, and Sunday, November 5, 11-4 pm. I will have several pieces for sale. Hope to see you there. Shop for unique fashion accessories, baskets, and home decor. Items hand woven, felted, or hand spun and knit. 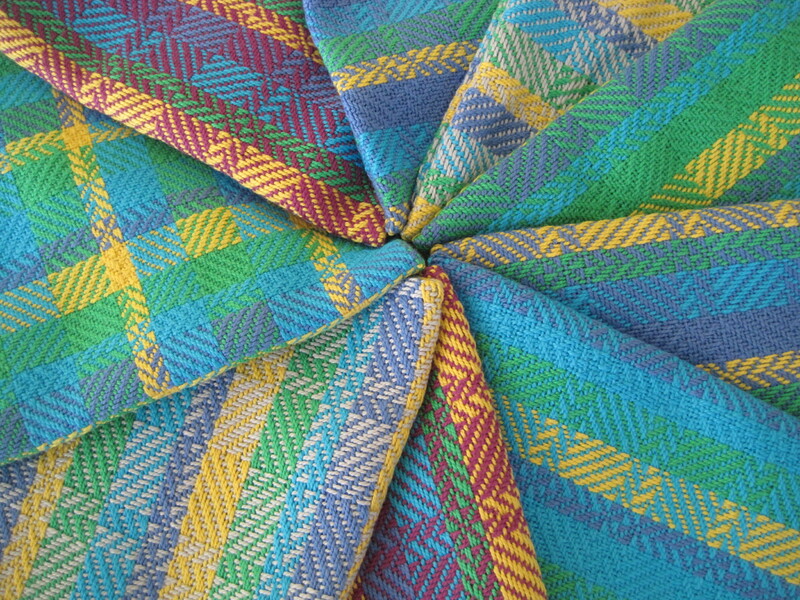 So this pattern comes straight from Handwoven magazine, May/June 1992 issue, page 50/87. 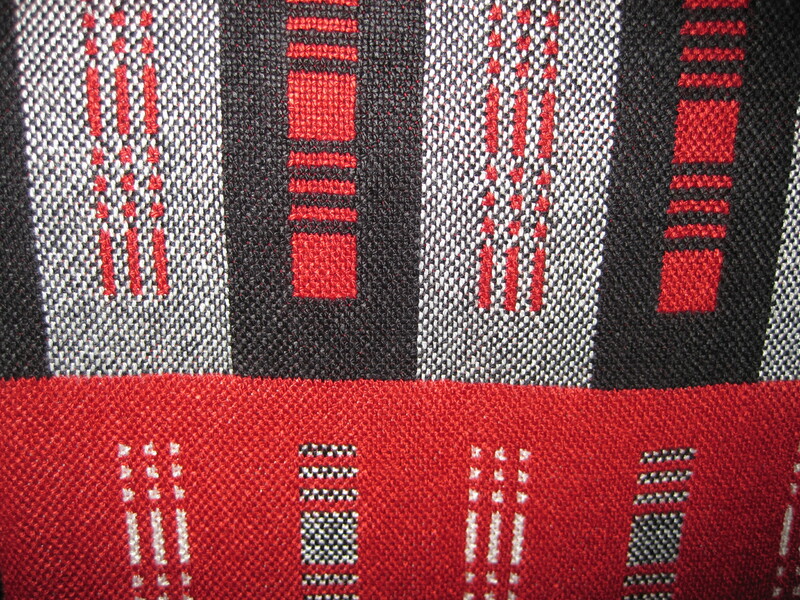 It is an eight shaft double weave pattern that appealed to me with the smart black and white checkerboard studded with red blocks, dots and dashes on one side, and a pure red with black and white blocks, lines and dots on the other. 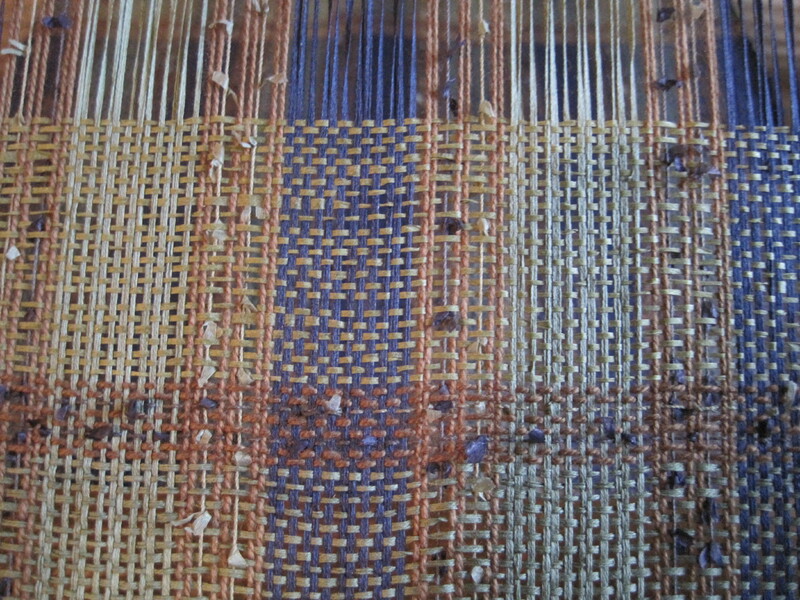 Just a fun weave for me, learning how the threading of double weave can have such a dramatic effect. 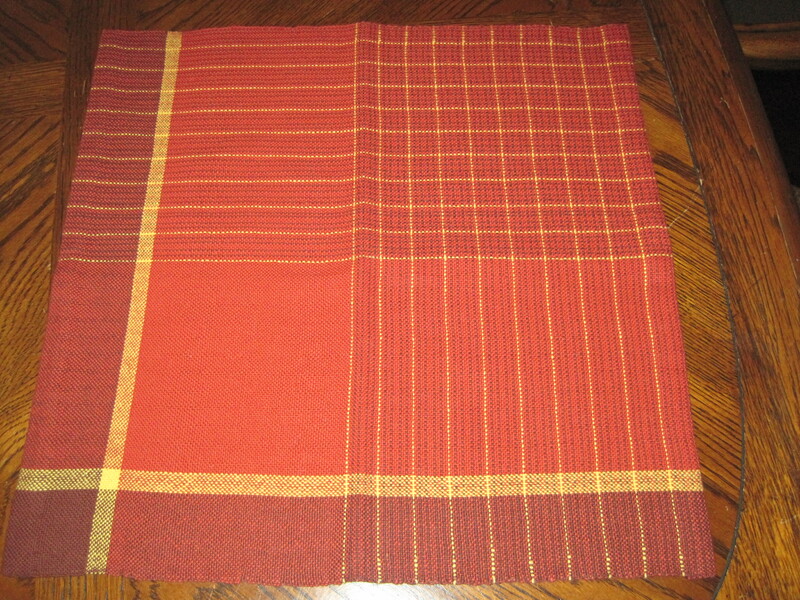 This was designed as a table runner, but I changed it up to create a light, drapable scarf in “bambu” 12 yarns. I had some trouble with edge threads breaking in the beginning six inches, but with a little focus and more careful beating, I was able to overcome this problem. 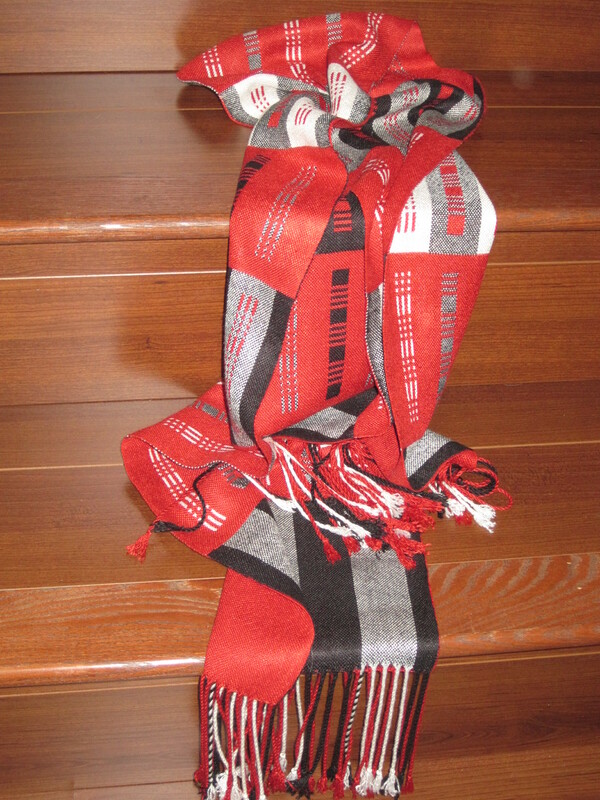 I wove the first scarf exactly following the printed directions, and hemmed, rather than fringed the ends. 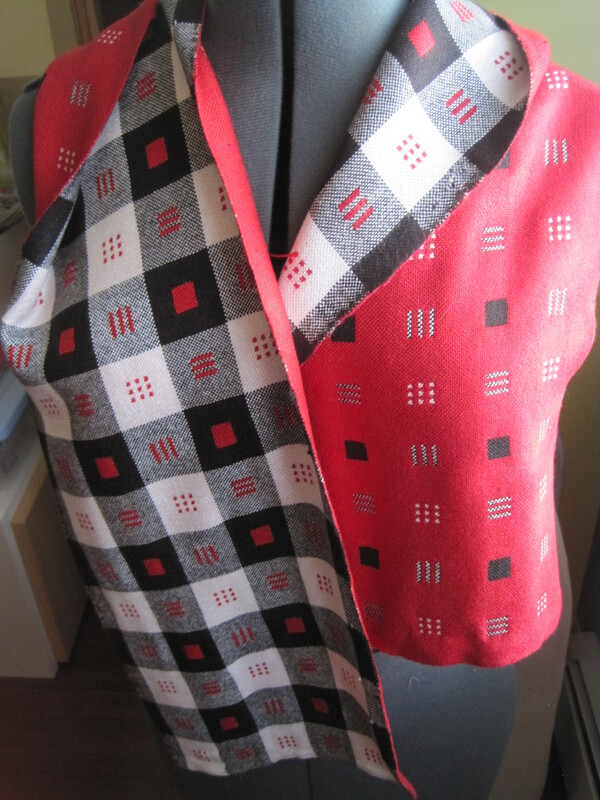 Once I understood the treadling sequence and how to place the blocks and dots and dashes, I changed it up for the second scarf to have six inch colour blocks with black or white or red on top, and then placed the colour accents in columns. The checkerboard is gone, replaced by stripes and columns of contrast. 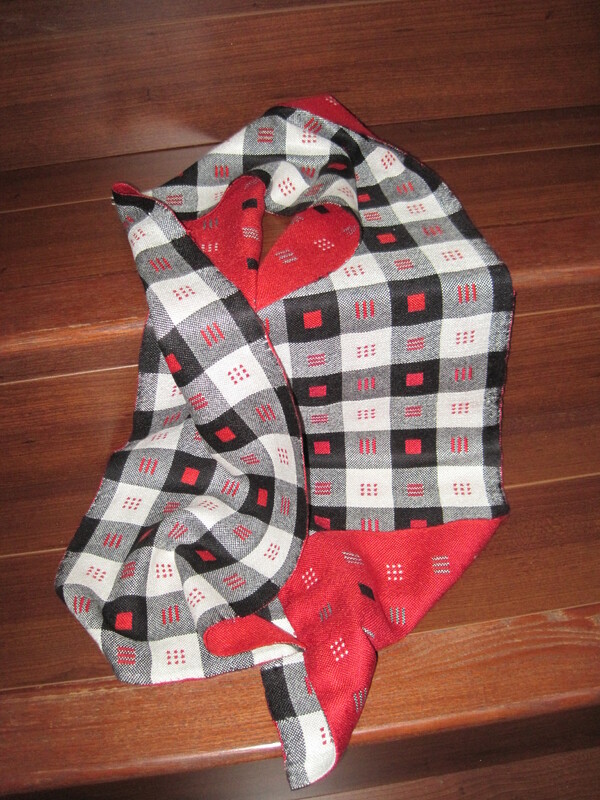 I really love how this second scarf turned out, and how it looks quite different from the first. 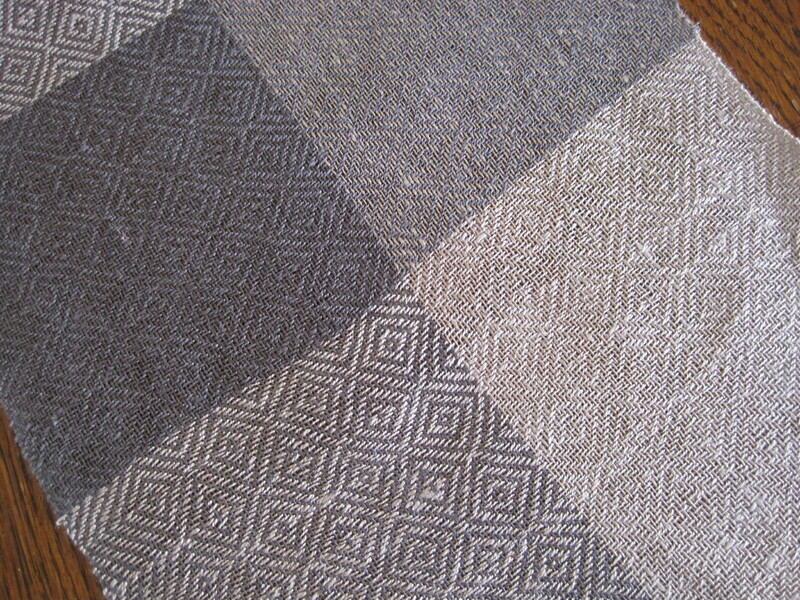 The first and last six inches are woven in solid colours in two separate layers. 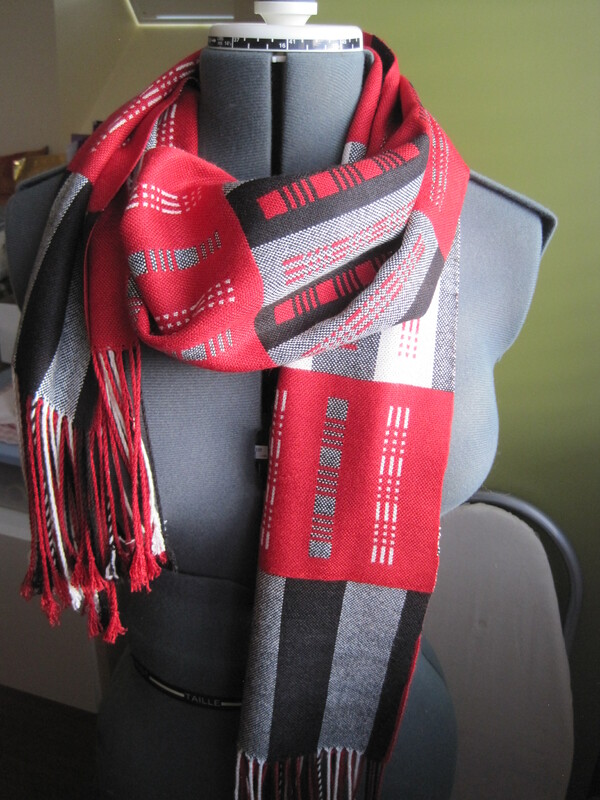 The scarf is finished with a lovely three colour fringe. 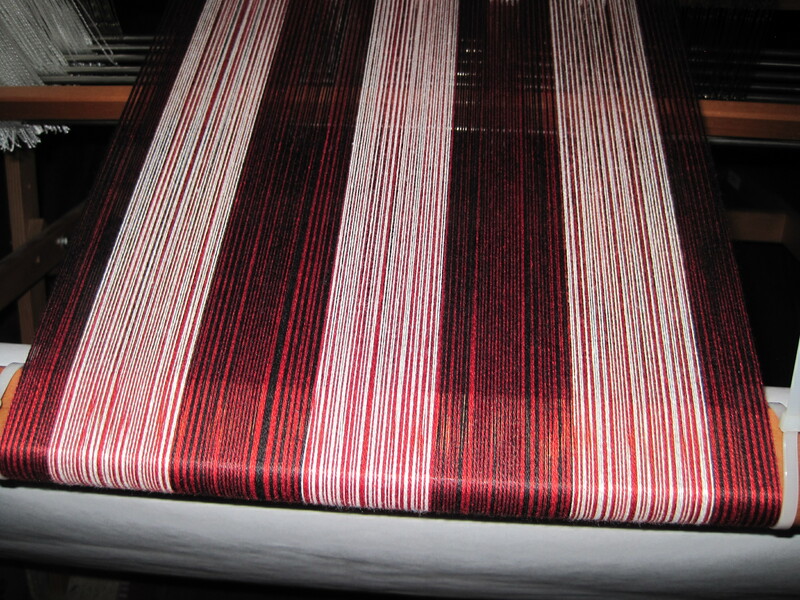 The warp and weft are Bambu 12 sett at 40 epi (20 per layer) and woven at 20 picks per inch per layer, threaded and treadled following the instructions in Handwoven. 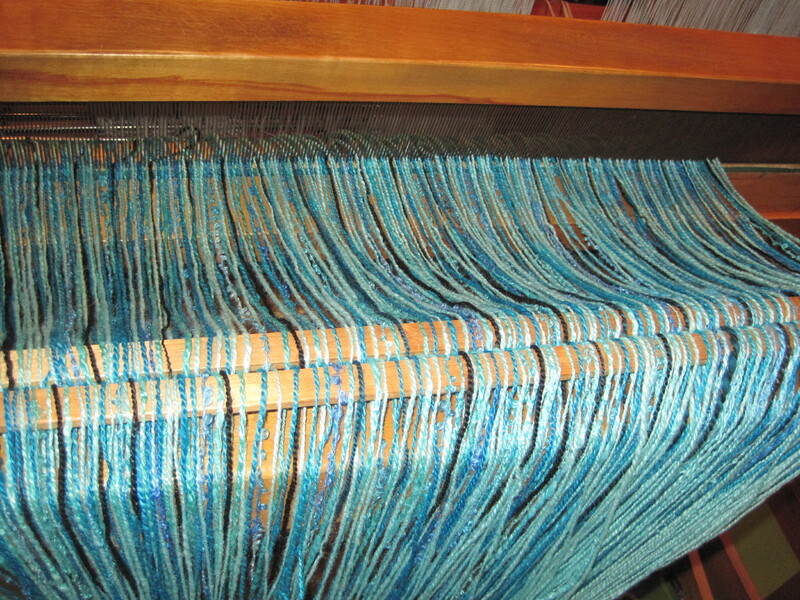 The warp was 5.5 yards long. These napkins were inspired by the colours in my kitchen/family room, and remind me of spices: turmeric, cayenne and nutmeg. 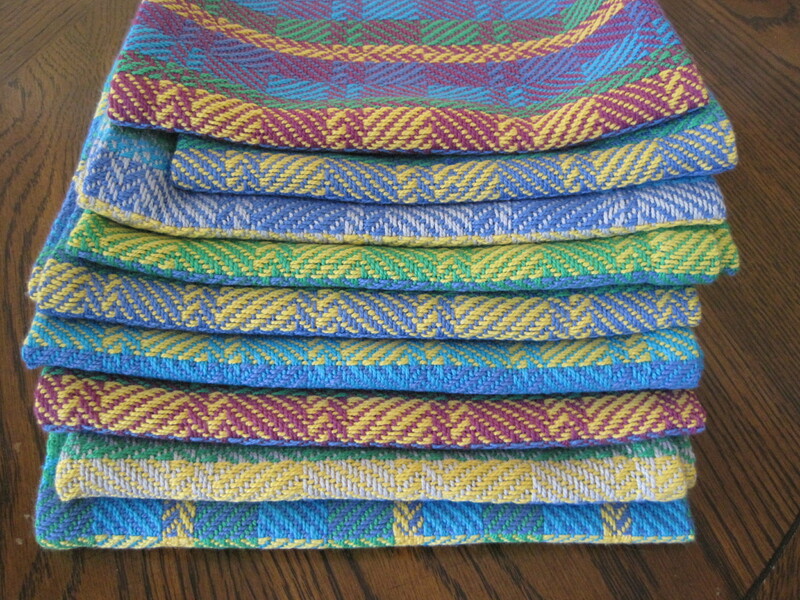 I intend to weave luncheon size napkins and they are 18” x 18” on the loom. 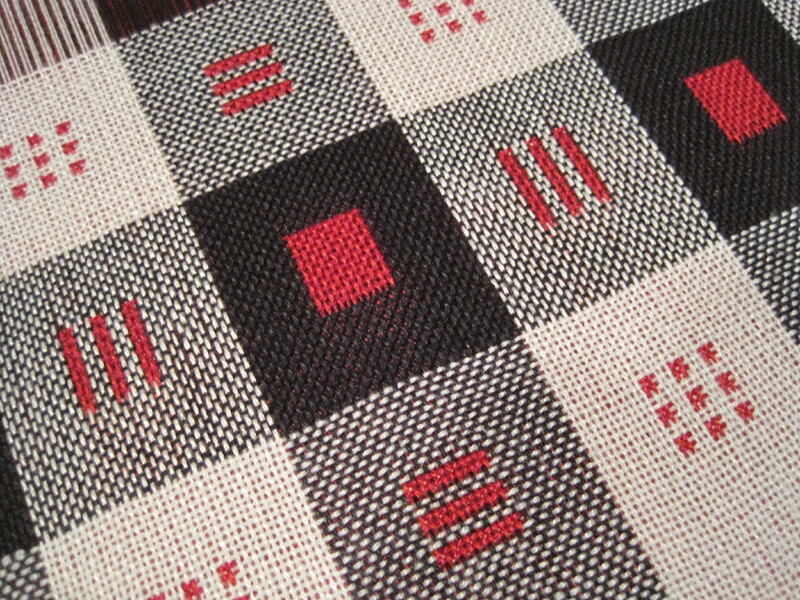 I saw the colour and weave draft on Pinterest, and the source of the draft for the colour and weave section is found on Handweaving.net: Figure 108, A Manual of Weave Construction, Ivo Kastanek, 2 shaft, 2 treadle. For these napkins I used the colour and weave draft for the first half of the warp, and for the second half of the warp I used the same number of threads of each colour to create colour blocks. 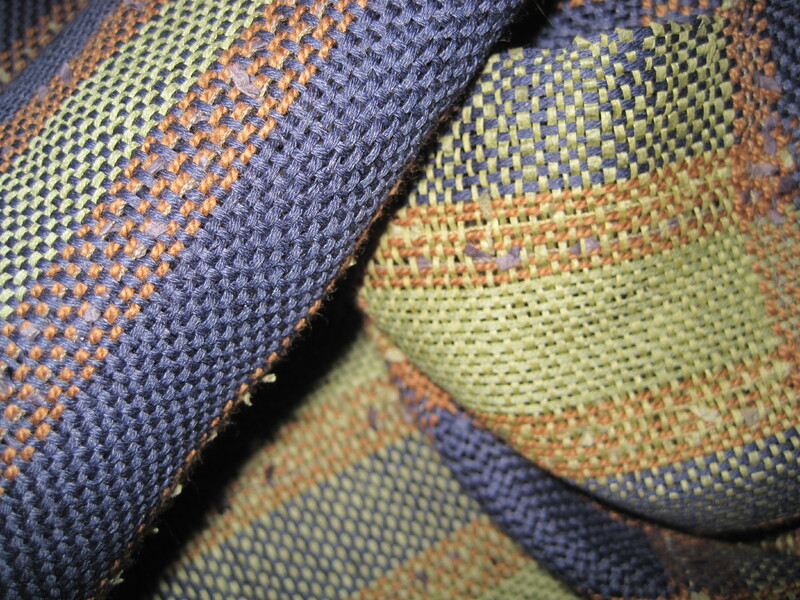 When woven, I treadled in plain weave following the colour order of the warp. (I added a one inch hem on each end of each napkin). This gives me a square napkin with one quadrant showing the colour and weave pattern, one quadrant with horizontal stripes, one quadrant with vertical stripes and the final quadrants with colour blocks. 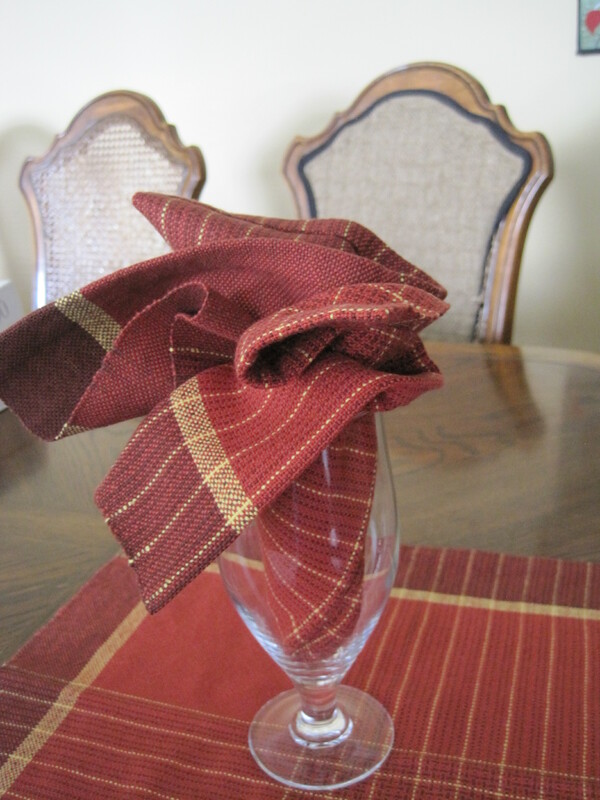 Although I wove all four napkins the same way, the changing colours kept it interesting. Colour order: Cayenne 2, Brown 1, Cayenne 2, Brown 1, Cayenne 3, Brown 1, Cayenne 2, Brown 1, Cayenne 2, Yellow 1. Picks per inch: 18 p.p.i. 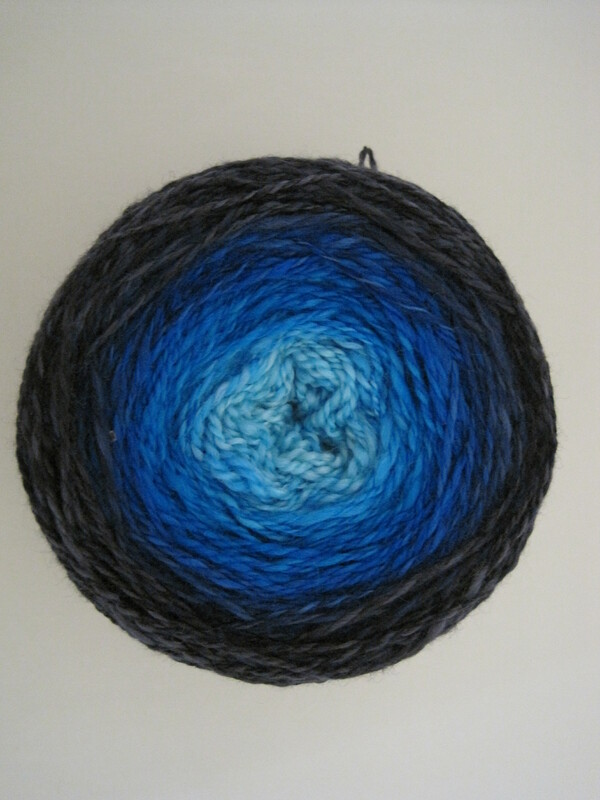 As the snow continues to build up outside, I have been snuggled down and spinning. 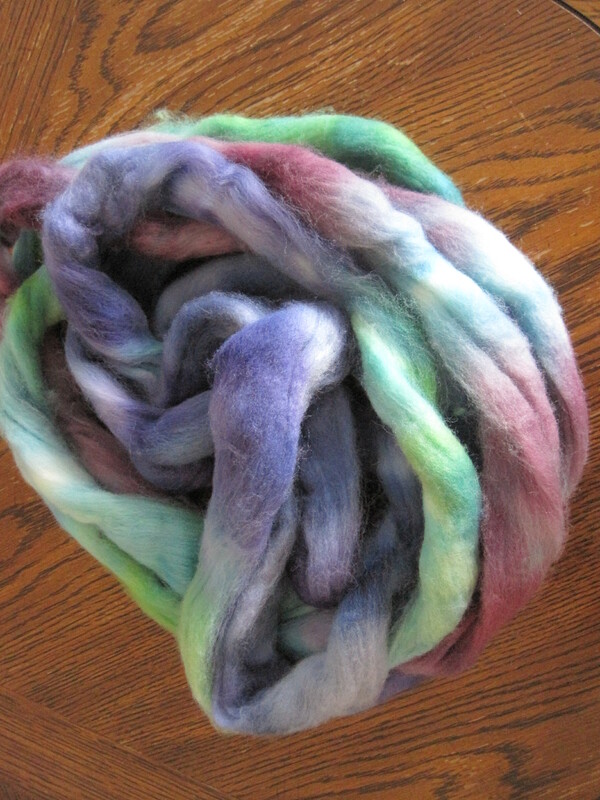 The fibre is titled “Unsung”and dyed by Kinfolk in blues, pinks, greens and purples. 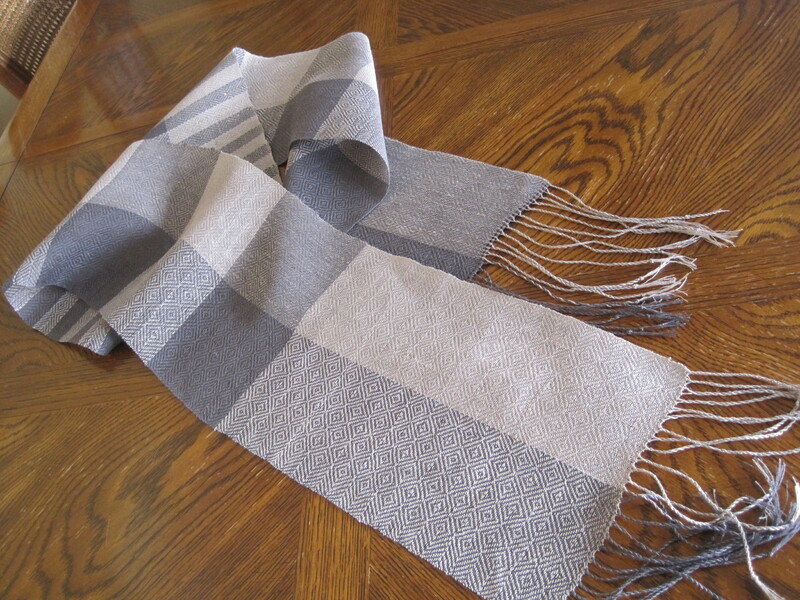 100% organic Polwarth wool. 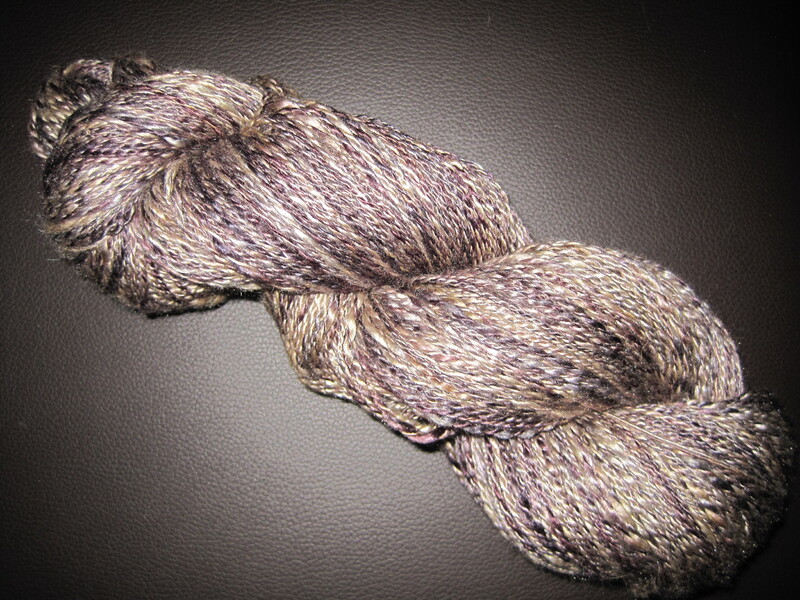 It became a soft, heathery yarn, almost 500 yards of 2 ply from 4 oz of fibre. A dream to spin, it did not take long at all. Next, a very fine 2 ply of 50% camel, 50% silk. This colour I called petroleum because the colours reminds me of looking at a gasoline slick, and the finished yarn has a silky hand. I’m looking at knitting patterns to see what will become of these yarns. Meanwhile, a favourite knit of mine, is this wedge-shaped shawl, I knitted from the previously spun “Spinning the Blues” yarn spun earlier. The pattern is a mash-up: the shape taken from one pattern, the lace from another and the picot edge from somewhere else. The shawl is a joy to wear, and to touch. My mini-quilt for January is completed, and here it is shown both front and back. I have included on the front a piece of every thread that passed through my hands and used in some capacity throughout the month of January. 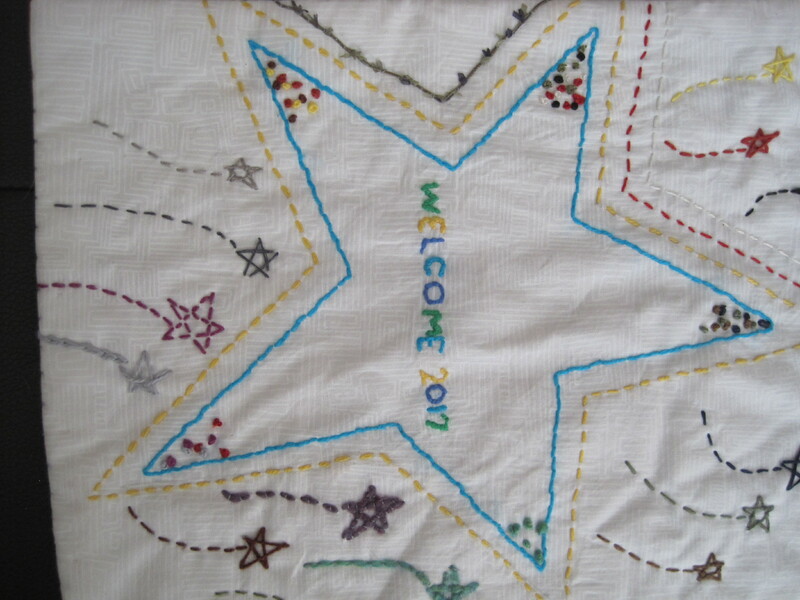 Hand-stitched in straight stitch, back-stitch and French knots. 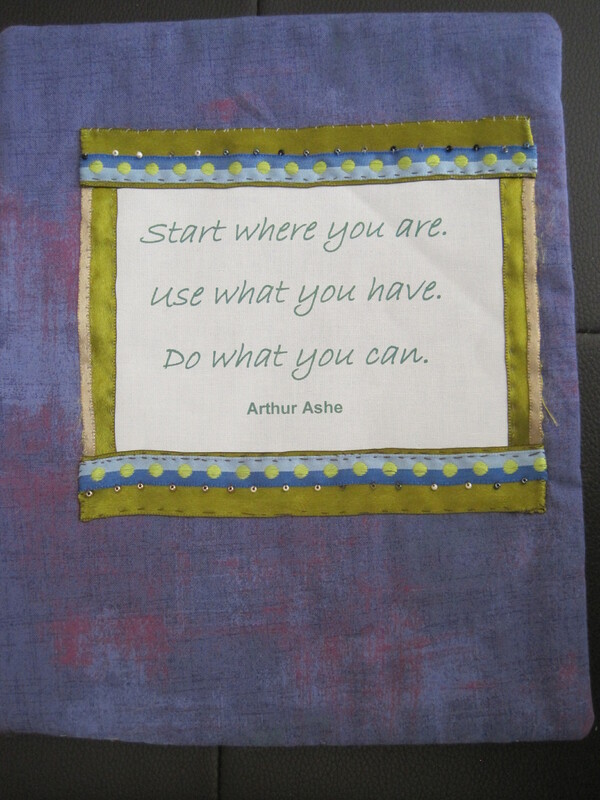 My theme for this year is to work from my stash as much as I can, and this is reflected in the quote from Arthur Ashe. As I am stitching I am reflecting and meditating on my world and the world around me. Using the resources that I have at hand without causing further damage to the environment. Extending a hand to others in friendship and welcome. Thinking about what I can do to make my home, my community and my my world a better place, then doing what I can to make it happen. For me, creativity is taking a simple length of thread and creating something marvelous from it. Or, if not something marvelous, then at least something useful! Now, my attempts to manipulate thread can be as messy or as beautiful as my life. It can be boring, exciting, calming, stimulating, even painful. 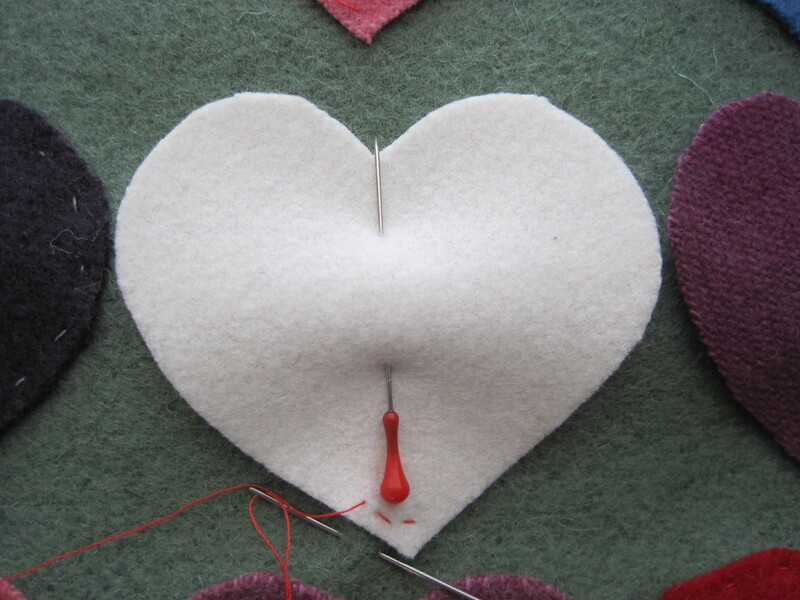 But sometimes the joy of playing with thread simply takes my breath away. I decided to commemorate my progress by capturing pieces of threads in pictures for my journal. 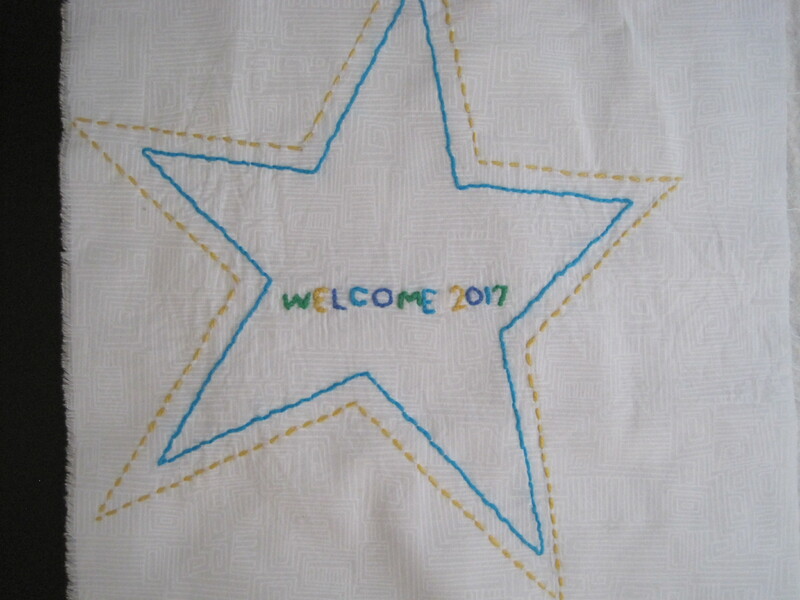 Here I celebrate the entrance of 2017 by using thrums from the turned twill napkins just completed. This picture will be added to throughout the month as more threads flow through my hands: thrums from the weaving looms, folded samples from the spinning wheel, cut ends from the knitting needles. And so, in celebration of life and threads, I give you a glimpse of the threads I am playing with this week. On my spinning wheel, it is back to basics with 100% Organic Polwarth wool, hand-dyed by local indie dyer Kinfolk Yarn and Fibre. The colour combination of blue, purple and green has been named “Unsung”. 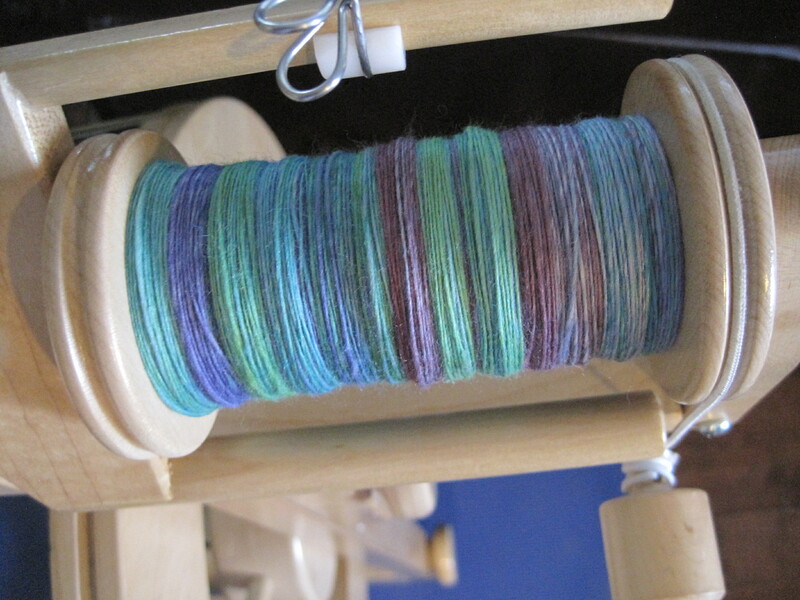 I’m spinning a nice, soft singles in worsted backward draw, just letting the colours come as they may, later to be combined in a two ply yarn. My looms are freshly dressed, and weaving will be happening. 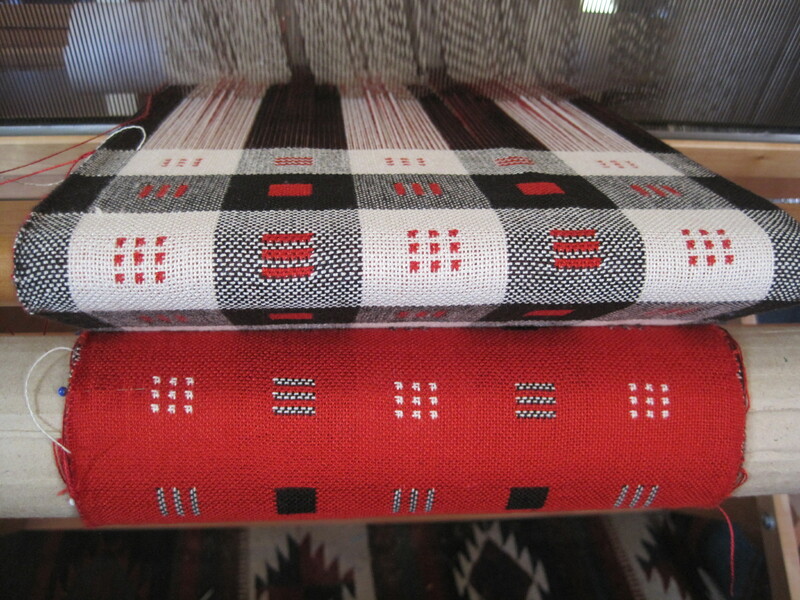 I have three looms dressed in my weaving studio, with three projects in process. One of my priorities this year is to shop from my existing inventory (OK my stash) as much as possible. I have some “more expensive” yarns that have been on my shelf for a number of years, so what can I possible be saving them for? 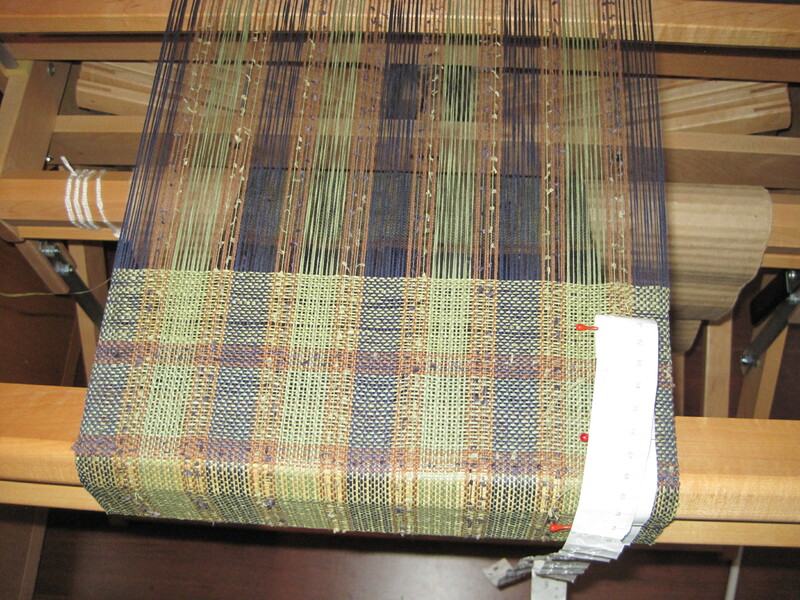 On “Loomella”, my eight shaft Schacht baby wolf loom, I warped this fun blend of cotton and paper yarns from Habu textiles, in navy blue, apple green, and brown. 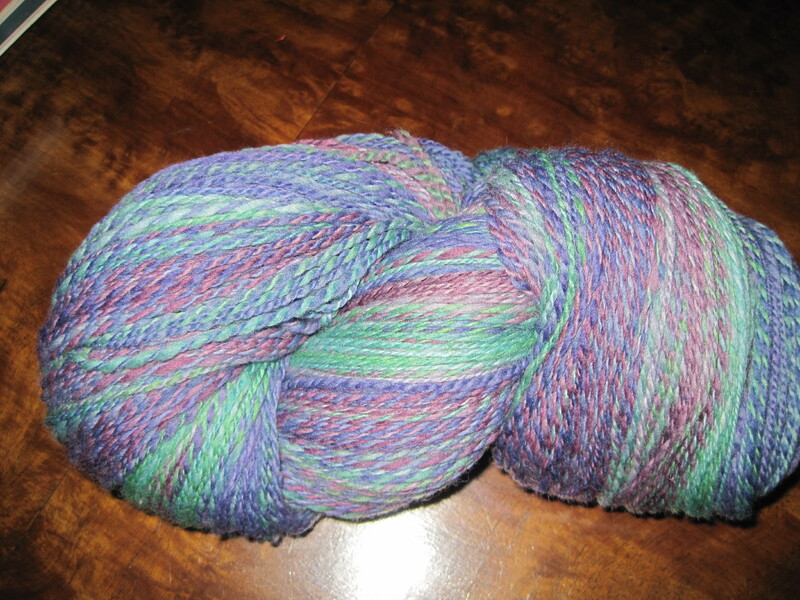 The textured yarn, is a linen and paper blend. 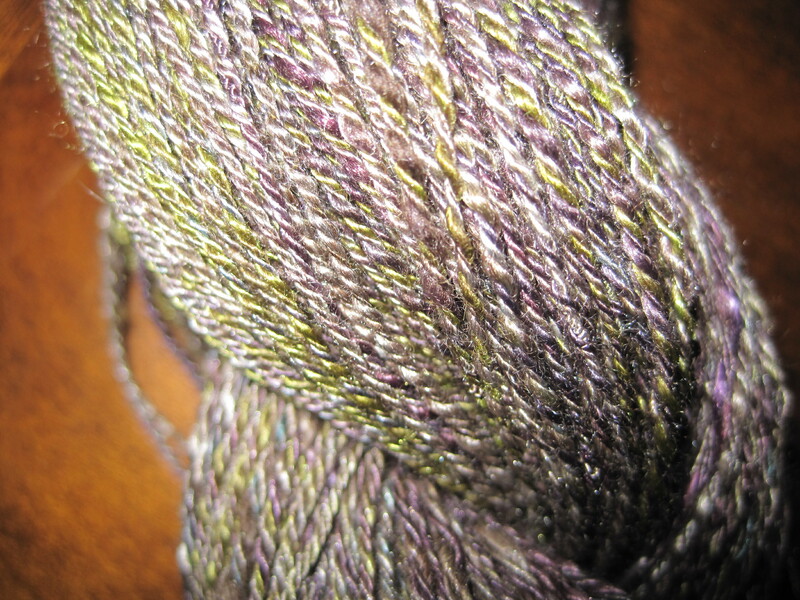 The yarns feel a little like raffia, and are very springy. I thought plain weave with some supplemental yarn floats and an open, airy sett would be the best way to show the yarns off. 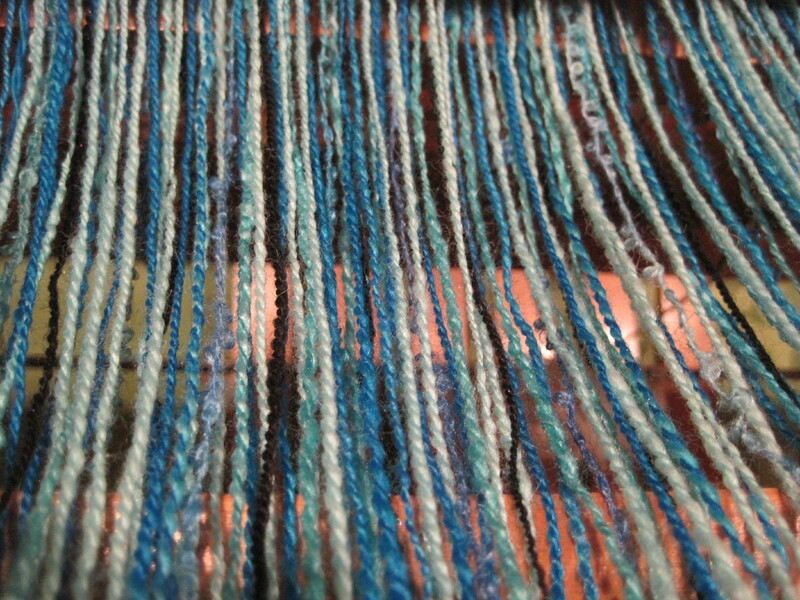 This is intended to be a scarf, but may turn into something else, depending on the drape of the finished product. And being wound onto “The Queen”: I raided my handspun stash to combine all the turquoise blue yarns into a mixed yardage for a jacket. The boucle is a commercial yarn, but everything else is my own handspun. Finished! 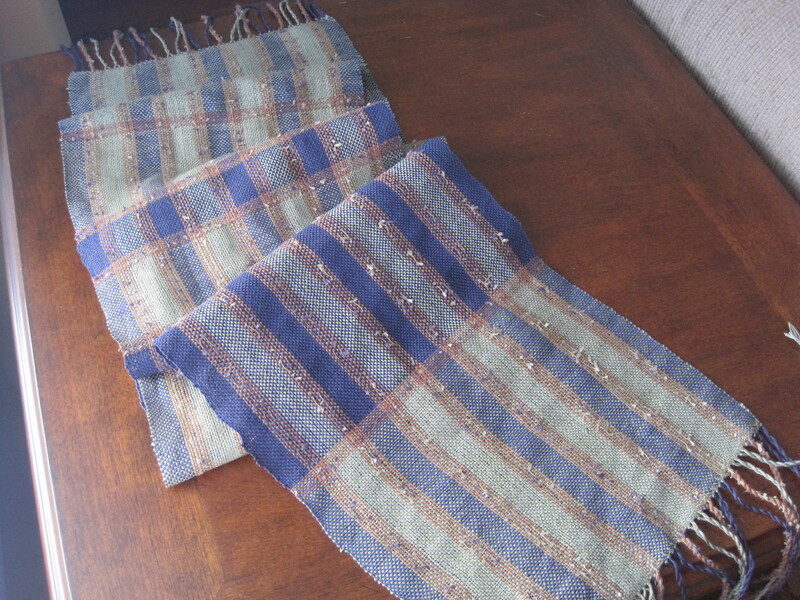 This morning I finished hemming this set of nine napkins, made from organic cotton and woven in a turned twill pattern. As I am working this week I am enjoying the sun pouring through the windows of my studio and bright blue skies. It is cold outside as the temperatures remain below freezing. I am so grateful that I no longer have to commute into the city, and can work in my warm, cozy studio. 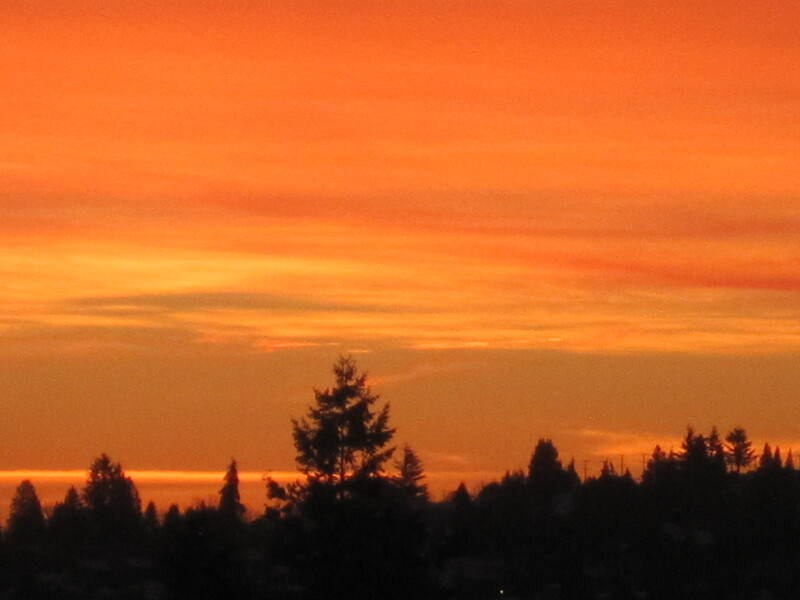 I appreciate the calmness and space of this week, after the rush and bustle of the holiday season. The creative process, combined with a burning curiosity remains central to my being. After enjoying a glorious day, I leave you with this picture taken from my studio window as the sun was setting last night. Peace to all.